I completely tore my ACL. I tore my LCL and biceps tendon. I also have damage to my peroneal nerve; all in one injury. I was playing soccer. I don't remember what exactly happened, but I had surgery done to fix my ligaments and the nerve is gradually coming back. The day I got hurt was April 21, 2007. 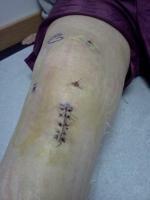 I got surgery done on November 14, 2007. No one in Colorado wanted to touch my knee so I went to Houston to have everything checked out and the surgery done. The emergency room just took x-rays and couldn't find anything wrong. An MRI was done and the torn ligaments were seen. The nerve damage wasn't noticed until I saw an orthopedist who noticed I couldn't lift my foot up. Physical therapy prior to surgery didn't help the nerve damage. At six months after the surgery my nerve still isn't 100 percent.